Is Manny Pacquiao Training Differently for the Juan Manuel Marquez Fight? Manny Pacquiao has made it no secret that he is taking his upcoming bout against Juan Manuel Marquez very seriously. Admitting that he wasn’t been as dominant as he hoped to be in his last two fights, the Filipino champion pledged that on Dec. 8 he would erase all doubts. How? By knocking Marquez, the man who has given him more trouble than anyone else in recent memory, out. Early reports out of Pacquiao’s training camp have been mostly positive. Bob Arum remarked that his guy looked a bit rusty during sparring sessions, initially, but acknowledged that it was to be expected given the long layoff he has had since the Timothy Bradley fight. Aside from that, though, everyone seems to agree that there weren’t any problems with the champ’s preparation. As "Fighter of the Decade" Manny Pacquiao winds down his first week of training at the Wild Card Gym of Freddie Roach in Los Angeles with his third sparring session today, there are plans to try some "new things" next week. Strength and conditioning coach Alex Ariza told BoxingScene.com/Manila Standard that while both trainer Roach and himself were pleased over the first week&apos;s training and were more than happy to see Pacquiao in good condition after two weeks of training in his hometown of General Santos City, they plan "to introduce new things next week." However, Ariza didn&apos;t indicate what the new things are. What could those new things be? It’s not like Pacquiao is a new fighter – this is a veteran guy who is pretty set in his ways. It’s unlikely that he could change much up stylistically at this point even if he wanted to. The only thing, maybe, they could be trying to alter right now is his knockout strategy. Mind you, Pacquiao hasn’t recorded a knockout since 2009. Part of that is because his opponents began running from him after that, but part of it (i.e. against Bradley) is because he just simply hasn’t been able to do it. Weigh in below: what mysterious new thing do you think Pacquiao is working on right now? Is Juan Manuel Marquez Making Manny Pacquiao Nervous? Manny Pacquiao, Juan Manuel Marquez to Fight in April 2013? 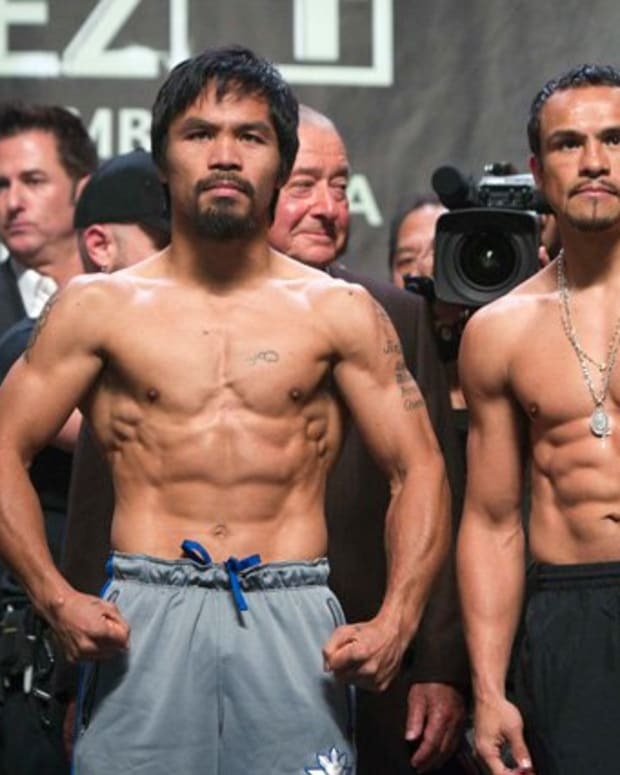 Did Manny Pacquiao Lose to Juan Manuel Marquez Because of Bad Conditioning?